Designer from Titanic, The Matrix & Spore. 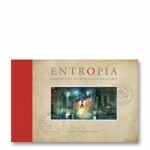 Welcome to the fascinating world of Entropia. Entropia: A Collection of Unusually Rare Stamps is a uniquely crafted storybook for all ages. Through a full-length narrative accompanied by 60 beautifully illustrated imaginary stamps, readers are taken on an unforgettable journey to a fantastic world. Categories: Books, we made too much on the reprint. Tag: christian scheurer.